Week 1 — Should You Rent Out or Sell Your Home? Week 2 — Decided to Rent Out Your Home – Now What? Week 3 — Should You Hire a Property Management Company? Our final installment covers the specifics for becoming a landlord in the District. Each municipality has certain laws and regulations that property owners must abide by and this article is a good rundown for DC landlords. The District has its own set laws and regulations for becoming a landlord that other jurisdictions don’t. In fact, it’s more stringent than most other localities in the metro region. As a DC landlord, you’ll have additional legal requirements and paperwork that need to be completed before you can even rent out your home – whether it’s a house, townhome, condo unit, basement apartment or even a single room. Keep in mind that it’s important to fully understand landlord-tenant laws in DC. The District is one of the most tenant-friendly jurisdictions in the country, so there are a lot of hoops landlords have to jump through to make sure the laws and rights of the tenants are being followed. You most likely appreciated these laws if you were ever a DC renter, but now as a landlord you don’t want to make any missteps. These laws are there to protect tenants from unsafe housing and unscrupulous landlords (not you!). But you need to protect yourself so you don’t break the law or face any penalties. Remember to consult with an attorney or a reputable property management company for details on current housing regulations and procedures, but below is our bonus guide to get you started on what needs to happen if you plan to rent out your DC home. The first steps involve lots of paperwork and several small fees to the District government. If you’re either going it alone or plan to work with a property management company, you still need to understand these steps before you can rent out your home. You also can use a company called Rent Jiffy (www.RentJiffy.com) that can help expedite the license process for you. It’s illegal to discriminate against families with children, so you can’t put your own cap on the number of occupants. The legal number allowed is two occupants per bedroom plus one more. So a two-bedroom condo could have up to five occupants. This law is meant to protect families but it also means that that the same place could have up to five 20-somethings splitting rent. A landlord can’t discriminate against someone who does not have a source of income to pay the rent as long as someone else can cover the monthly payments (meant to protect those in Section 8 housing). If a renter’s parent or family member will co-sign the lease, you can’t turn them away even though they don’t have a job. You need to follow several guidelines when dealing with prospective renters to adhere to the law. This will begin immediately when you list your home including the day the lease is signed and doesn’t end till the last day they live there. Remember you can contact the Housing Service Center at the Department of Housing and Community Development for more complete information. Tenant Bill of Rights (TBR). As of July 2015, DC landlords must provide rental applicants with a copy of the “DC Bill of Rights” (along with other disclosure documents required under the Rental Housing Act) and to have these prospective tenants sign the TBR to confirm receipt. If the landlord fails to have this done then they waive their right to increase the rent during the renter’s tenancy. Get a hard copy of the TBR at the DC Office of Tenant Advocate. Raising Rent. Give at least 30 days written notice if you will be raising the rent. How often and how much depends on whether it’s a rent-controlled property. Disclosures. You are required to make any necessary disclosures. For example, if your home was built before 1978 (even if it was renovated after that), then you need to disclose the possibility of lead-based paint to your tenant. 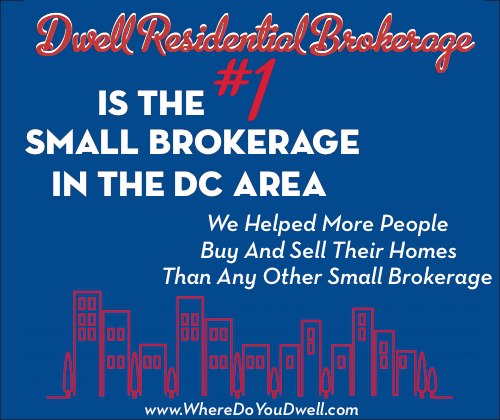 Before you can sell your DC rental property, you must first provide the current tenant with the opportunity to purchase it. This is where things can get complicated. If you are selling a home that has a tenant in the property, please make sure to work with an attorney or a real estate agent that is well versed in how to do so. It’s a very complicated process with very strict rules and deadlines. Not only that, but you then need to show the title company that you did everything correctly before they can allow the change in ownership to occur! 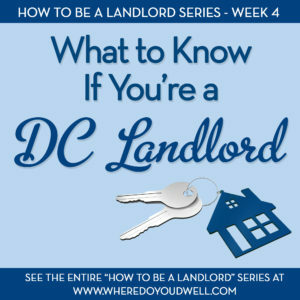 As you can see, there is a lot to know when becoming a landlord in the District. But if you’re prepared and organized, it can be a good investment down the road. Virginia and Maryland have their own set of laws and regulations, so check with their housing authorities for details. But nothing is like in DC, so we wanted to address this jurisdiction specifically.